We just returned from three weeks in Tokyo. 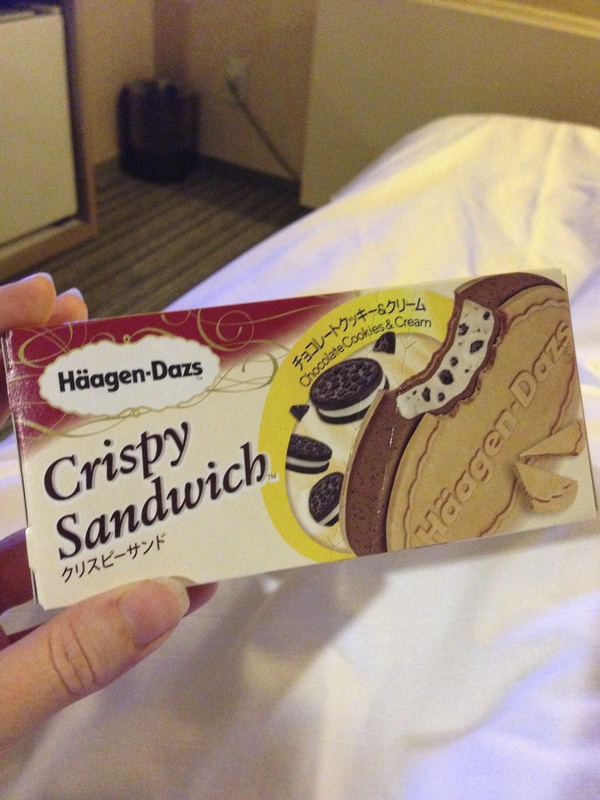 I didn’t get to try that crispy ice cream sandwich. It sure looks good. But I did have a taste of Haagen Dazs seasonal Rose Ice Cream. Oh my goodness, really rose! Wow. I sure wish Haagen Dazs would get more creative in the US. That rose ice cream was amazing. How exciting! I do hope you’ll share some of your adventures! Rose ice cream does sound interesting! hOhmaigahhhhh I love these so much!!! I guess I arrived in Japan almost a month after you tried this variety, so maybe the flavors had rotated already. I never saw this one, but kept running into a caramel one, chestnut, I think I saw a mango one, but my all-time fave was the choco-berry one. It was the first one I tried and remained the best! Yes! The cookies & cream seems to be discontinued 😦 I like all of the others, too! There just seems to be something so tasty about that crunchy shell and the crispy sandwich!